I was invited to a swimming party this week and I just didn’t know what to take with me. It was a kind of bring what you have to share dinner/snack type ordeal, so I wanted something easy to make but still pretty and tasty. I scanned the internet and found a few recipes, but they just didn’t quite fit the bill. I finally decided to try and use some things I had on hand and only had to pick up some ham, swiss, and some roma tomatoes to finish it off. So here it is, my layered biscuit bake. Keep your fingers crossed for the outcome. I’m hoping it’s delicious! line your pan with parchment paper or spray it with cooking spray. Press 4 unbaked biscuits in the bottom of the pan making sure to cover all of the bottom. 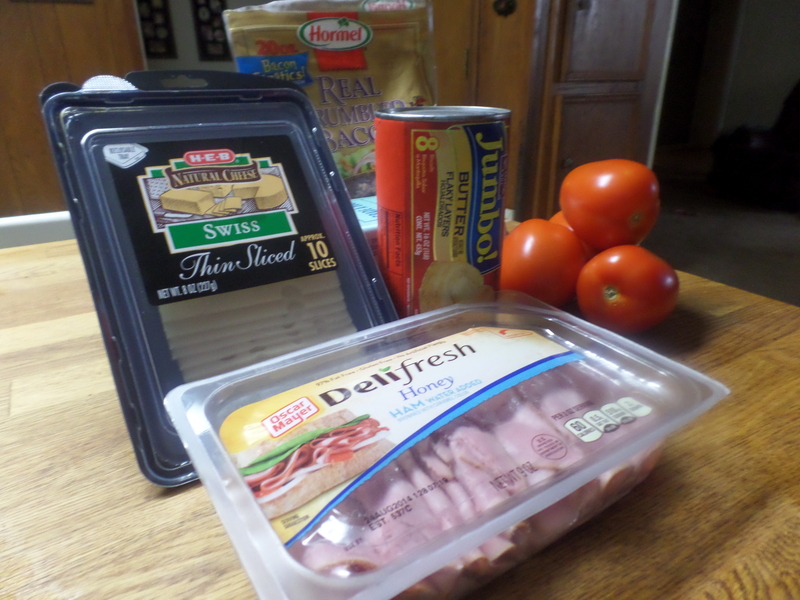 layer the ham, swiss, bacon and sliced roma tomatoes on top of the biscuits. Whisk 2 eggs in a bowl and brush eggs over the top of the layers. Roll out the remaining 4 biscuits and cover the top completely. Whisk the 2 remaining eggs and brush over the top of the biscuits. Put in oven on the bottom shelf and bake covered in foil for 20 minutes. 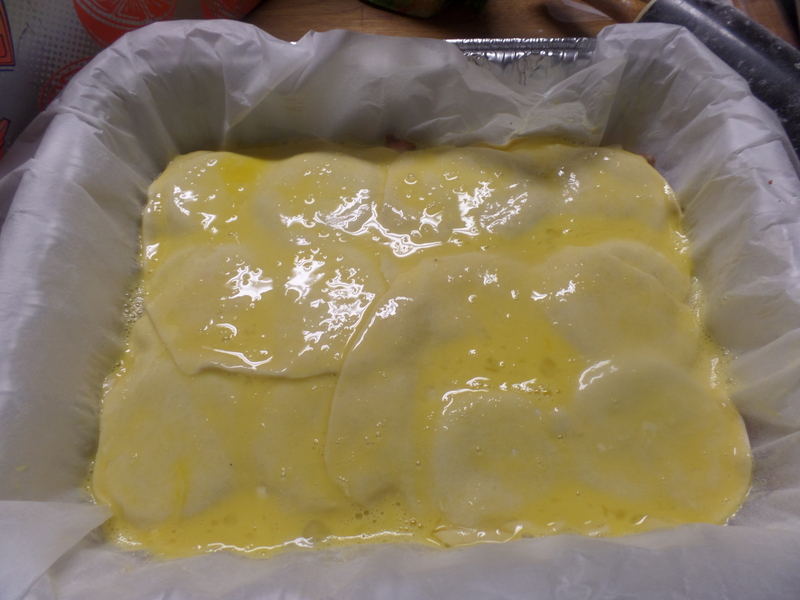 Remove the foil and bake another 25 – 30 minutes until very brown. This recipe is loosely based on one I saw on eatathomecooks.com: Kentucky Hot Brown Bake. I know you’d love her recipe as well. 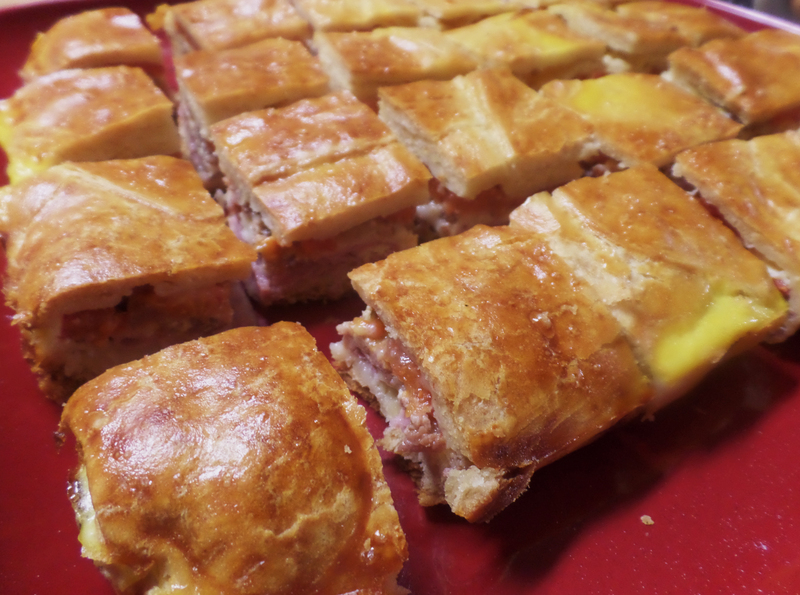 A great treat for parties and super bowl sunday! Remove the foil and bake another 25 - 30 minutes until very brown. Let set for 15 minutes before serving.